Stephen H. Malato practices in the area of real estate law, with extensive experience in project development, commercial lending, construction litigation, corporate organization and governance, and contracts and environmental compliance. 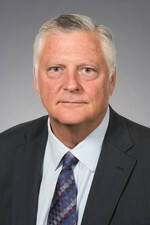 Mr. Malato joined Hinshaw & Culbertson LLP in July 1986. He is a past leader of the firm's national Real Estate & Construction Practice Group. Mr. Malato was elected as a Fellow by the American College of Mortgage Attorneys in 2004. Representation of American National Bank in connection with the Westridge Court Shopping Center, including acting as lead counsel for the three banks that provided the $41 million loan; acquiring the shopping center in a deed in lien of foreclosure transaction; working through lease issues with Phar-Mor Pharmacy, Spiegel and K-mart. Representation of Bekins Van Lines in connection with the leasing of a distribution center in Ohio and a distribution center in Utah. Representation of The Guardian Life Insurance Company of America/Hiffman Shaffer Associates, Inc. joint ventures, including the negotiation and preparation of leases with tenants such as DHL, Bally and Airborne Express. Representation of Travelers Insurance Company in connection with leasing of office space, retail space and industrial space in buildings in Traveler’s Equity Portfolio. Representation of American National Bank in bond financing involving the Bensenville Home Society, a Lutheran Charitable Organization that provides elderly care. Representation of LaSalle Bank in various loan transactions. Representation of GE-related insurance companies in mortgage lending transactions. "Chicago Real Estate Now," IIT Chicago-Kent College of Law, Chicago, Illinois, March 2016. Northwestern University Kellogg Graduate School of Management, lecturer, Real Estate Law Course, 1991–1993.